I had a very bad experience with this set of tires. I had them all four for over one year, in which we drove 10.000 miles at most. Within the last 3 months, 3 of the 4 tires progressively failed one after the other, with about a month in between them. They all started the same. A soft vibration that after a short while got worse and worse. I replaced the first one that failed with a used one of a different brand, I thought maybe it was something wrong with my suspension or probably my wife hit the curb or anything like that. About a month after, the second tire failed too, that was suspicious to me. I had my rear suspension checked and everything was just fine, since they were both in the rear part of the car. I bought a pair of new tires from Walmart to replace the used one I bought to replace the first Yokohama that failed and the second Yokohama that failed. Last and even worse, one of the remaining 2 Yokohamas located in the front suspension failed after about another month. This car is my wife's car, she drives 1000 km a month at most on very well maintained roads. Most of the time, she also carries our 1 year old baby in the car. So I bought another pair of tires to replace the front ones in order to avoid the fourth Yokohama tire from failing and probably getting her into an accident. I have had Yokohama tires before and that was the reason why I bought this set a few years ago. I kept 3 of the tires just to show Yokohama they still have more than 50%-75% of tread life. I contacted the manufacturer in Canada twice through their website and never got an answer from them. The failure was not catastrophic for us but it could have been if one of the tires would have blown while driving. The area where the tread goes got bumps and became irregular, causing the whole car to vibrate when driving it. I got very disappointed from this manufacturer, I will probably never buy tires from them again. Excellent grip on snow and ice. Price. 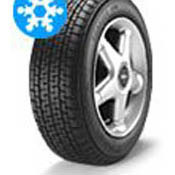 Wears quickly (characteristic of most winter tires) and could have better wet traction. These are the first set of winten tires that I''ve purchased and I must say I''m pretty impressed. They simply just bite into snow. Traction on ice is quite impressive also. However, the wet traction is good but could be better. But as long as you don''t drive like an idiot you will be just fine. I liked these so much I went out and bought a set for my girlfriends CRV, and they''re great! Horrible rain traction. Can you say sssssslide through the red light when it first starts sprinkling? Sidewalls are way soft, maybe this is a good thing on ice tires? Overall a decent, lower priced ice tire that handles the dry fairly well. This is my second set in 3 years and until I find something that compares pricewise I'll probably stick with these. An excellent tire on ice, good in snow. I have a long and very steep driveway and travel extensively on poorly maintained dirt roads and this tire performed as well if not better than others at a much lower price. I read somewhere that the tire performed poorly stopping on wet/dry surfaces. Recommended. I paid approximately 60.00 per tire. Not the best snow tire I've ever owned, but at $58 a tire it's relatively inexpensive. The tire doesn't seem to grip in thin coatings of snow, but have fairly good traction in 4-6" Above that and they're overmatched. Overall traction is just slightly better than a good all-season tire. Biggest problem is that they tend to breakaway during cornering rather unpredictably. They just don't seem to have the traction of a Blizzak or the 180Ps I previously had on the car. Aggressive tread pattern w/o sacrificing longevity. My driveway is extremely long, and on a steep grade, yet my car gets up my driveway with no problem. Since purchasing these tires, I have rarely felt any slip. My car is a large luxury car, Chrylser LHS, so I have no opinion as to how these tires would perform on a smaller and/or sporty car. In a top consumer's magazine, the yokohamas were rated best, even over tires such as the blizzak. The best winter tires I've ever owned! Great snow traction, long wear, great ice grip and a great price make these a great choice. Bridgestone Blizzak, Michelin Arctic Alpin. Guardex 600 is being replace by new design...Hope it is as good. I have used this set(4)on 2 different cars for the past 4 winters(NorthEastern Climate).Great traction on hardpack,on ice,in freezing rain you name it ...this tire handles all condition.It should be good for another season, so wear has been excellent.